She smokes a pipe, wears men’s clothes and wants to be alone. He’s laid claim to her private retreat in an isolated part of a park. Philip can’t figure June out: Is she fiery and independent, or spinning out of control? First staged at the Fringe of Toronto in 1991, Sanctuary was performed in New York in 1992. 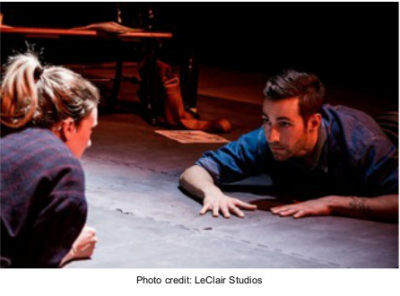 It has since been staged at several one-act festivals, and in recent years has been produced in Britain, Canada and the U.S.
Excerpts have been published in You’re Making a Scene and Another Perfect Piece, both published by Playwrights Canada Press.